Objective To assess the relative risk of perinatal mortality, severe preterm delivery, and low birth weight associated with previous treatment for precursors of cervical cancer. Data sources Medline and Embase citation tracking from January 1960 to December 2007. Selection criteria Eligible studies had data on severe pregnancy outcomes for women with and without previous treatment for cervical intraepithelial neoplasia. Considered outcomes were perinatal mortality, severe preterm delivery (<32/34 weeks), extreme preterm delivery (<28/30 weeks), and low birth weight (<2000 g, <1500 g, and <1000 g). Excisional and ablative treatment procedures were distinguished. Results One prospective cohort and 19 retrospective studies were retrieved. Cold knife conisation was associated with a significantly increased risk of perinatal mortality (relative risk 2.87, 95% confidence interval 1.42 to 5.81) and a significantly higher risk of severe preterm delivery (2.78, 1.72 to 4.51), extreme preterm delivery (5.33, 1.63 to 17.40), and low birth weight of <2000 g (2.86, 1.37 to 5.97). Laser conisation, described in only one study, was also followed by a significantly increased chance of low birth weight of <2000 g and <1500 g. Large loop excision of the transformation zone and ablative treatment with cryotherapy or laser were not associated with a significantly increased risk of serious adverse pregnancy outcomes. Ablation by radical diathermy was associated with a significantly higher frequency of perinatal mortality, severe and extreme preterm delivery, and low birth weight below 2000 g or 1500 g.
Conclusions In the treatment of cervical intraepithelial neoplasia, cold knife conisation and probably both laser conisation and radical diathermy are associated with an increased risk of subsequent perinatal mortality and other serious pregnancy outcomes, unlike laser ablation and cryotherapy. Large loop excision of the transformation zone cannot be considered as completely free of adverse outcomes. As the incidence of cervical intraepithelial neoplasia requiring treatment (that is, grade II or worse) peaks at around the age of 30, any possible effects of such treatment on future childbearing are of particular importance.15 In a recent meta-analysis, Kyrgiou et al evaluated a limited number of pregnancy outcomes in women previously treated for cervical intraepithelial neoplasia.16 This pooled analysis reported that the risks for preterm delivery among women treated with large loop excision of the transformation zone or cold knife conisation were 1.7 (95% confidence interval 1.2 to 2.4) and 2.6 (1.8 to 3.7) times higher than in untreated women. A significantly increased risk was also noted for low birth weight after both these procedures, for premature rupture of membranes after large loop excision, and for caesarean delivery after cold knife conisation. Preterm delivery, low birth weight, and premature rupture were more common after laser conisation but the differences were insignificant. Laser ablation was not associated with adverse obstetric outcomes. It was concluded that all excisional treatment procedures might be associated with adverse pregnancy outcomes. 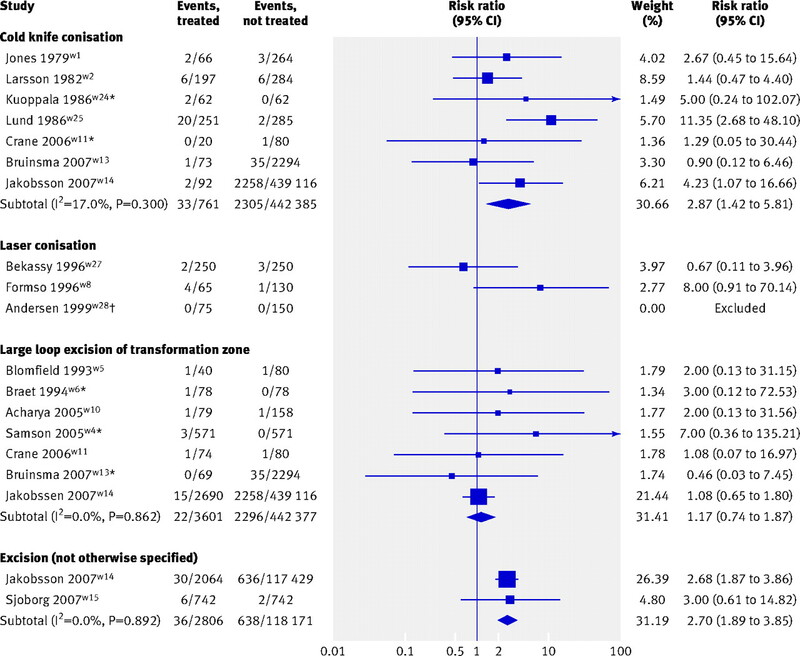 The publication of Kyrgiou et al’s meta-analysis has been followed by two small studiesw10 w11 and four involving large populations.w12-w15 This new information, together with data received directly from authors, now allows a new more comprehensive systematic review and meta-analysis with a focus on more serious outcomes like delivery before 32 weeks, birth weight under 2000 g, and perinatal mortality that previous reviews have not been able to analyse. We included studies with data on severe obstetric or neonatal outcomes in women treated for cervical intraepithelial neoplasia and in a control group of untreated women. Two types of treatment were considered: excisional procedures (cold knife conisation, large loop excision of the transformation zone, and laser conisation) and ablative procedures (laser ablation, cryotherapy, and diathermy). The severe adverse obstetric or neonatal events were perinatal mortality, severe (at less than 32/34 weeks’ gestation) and extreme (<28/30 weeks) preterm delivery, and severe low birth weight (<2000 g, <1500 g, and <1000 g). Eligible studies published between 1960 and November 2007 were retrieved through a PubMed-Medline and Embase search with the keywords: cervical intraepithelial neoplasia, CIN, cervical cancer, LLETZ, large loop excision of the transformation zone, LEEP, loop electrosurgical excision procedure, cold knife conisation, laser ablation, laser vaporisation, laser conisation, laser excision, pregnancy outcomes, peri-natal mortality, preterm delivery, and low birth weight. We also hand searched references of the retrieved articles and the proceedings of the relevant conferences to identify any articles missed by the initial search and any unpublished data. There was no language restriction. Three authors (MA, MK, and CS) verified inclusion and exclusion criteria independently and reached consensus in case of discordance. Studies were classified according to type of treatment (excisional or ablative) and by specific treatment. From every included study we extracted or computed the total number of pregnant women treated and not treated for cervical intraepithelial neoplasia and the number of adverse obstetric or neonatal events in both groups. We contacted authors to obtain data on outcomes by particular treatment procedure if they were not provided in the original reports. In addition, we collected data on the study design and matching criteria applied for the selection of a control group of non-treated women. We calculated the relative risks for each adverse pregnancy outcome in the treated versus untreated women. Studies were separated by type of treatment and further grouped by treatment procedure. We used a random effects model to pool relative risks.17 In studies with no events in the treated or control group, we added 0.5 to each cell of the contingency table (continuity correction) to allow calculation of relative risk. We excluded studies with no events in both groups from the meta-analysis. We assessed heterogeneity between studies with Cochrane’s Q test and evaluated the percentage of total variation across studies caused by heterogeneity with I2.18 19 The relative risks for severe adverse pregnancy outcomes were not pooled when there was evidence of significant heterogeneity between studies (P<0.10). In the absence of heterogeneity between groups we computed overall relative risks by weighting the counts of the control group according to the size of the corresponding treated groups for studies that contributed data for multiple procedures. We used Stata/SE 9.2 for Windows (StataCorp, College Station, TX) for statistical analysis. Figure 1 shows the variation in relative risk for perinatal mortality associated with excision of cervical intraepithelial neoplasia.⇓ This forest plot contains subgroup meta-analyses by treatment procedure. Because of significant heterogeneity between procedures (P=0.031), we have not shown an overall pooled relative risk. The risk of perinatal mortality was significantly increased in women treated with cold knife conisation (relative risk 2.87, 95% confidence interval 1.42 to 5.81). The Norwegian study showed an outlying high relative risk of 11.35 (2.68 to 48.10).w25 Omission of this study still yielded a pooled relative risk that was significantly different from unity (2.08, 1.04 to 4.13). Four of seven studies showed a non-significantly increased risk of perinatal mortality in women treated with large loop excision of the transformation zone,w4-w6 w10 whereas in three the relative risk was near to or not significantly lower than unity.w11 w13 w14 This yielded a pooled relative risk of 1.17 (0.74 to 1.87). Women whose cervical intraepithelial neoplasia was treated by excision without specification of the procedure showed a significantly increased risk of perinatal mortality. Although the risk associated with ablative treatment was not increased (fig 2)⇓, there was a tendency for increased perinatal mortality in women treated with diathermy (relative risk 1.54, 0.84 to 2.82). Severe preterm delivery (gestation <32/34 weeks) was significantly more common after cold knife conisation (pooled relative risk 2.78, 1.72 to 4.51) (table 2)⇓. Treatment of cervical intraepithelial neoplasia with large loop excision resulted in a non-significantly increased risk of perinatal mortality (1.17, 0.74 to 1.87) (fig 1).⇑ Three of the seven studies, however, showed no counts in one of the comparison groups,w4 w6 w13 necessitating the use of a continuity correction (κ=0.5). Table 7⇓ shows the results of alternative models for combining relative risks and different continuity corrections. All models and continuity corrections resulted in similar pooled estimates, underlying the robustness of the meta-analysis. Similar pooled relative risks for perinatal mortality were also obtained for the other excisional methods (data available from authors). Too few studies evaluating other outcomes were available to test the robustness of the pooled estimates. We pooled the absolute frequency of adverse obstetric outcomes after treatment (pT) and in the cumulated control populations (pC) and derived the number needed to treat to observe obstetric harm in one treated woman (NNTH) (table 8).⇓ We excluded the study of Lund et alw25 because of outlying relative risks that we considered were not representative for the other studies. We estimated that previous treatment with cold knife conisation, laser conisation, or diathermy would result in about one perinatal death in every 70 pregnancies. After large loop excision of the transformation zone, however, we estimate only two perinatal deaths in 1000 pregnancies. Severe and extreme preterm delivery and low birth weight were common (NNTH often <60) after cold knife conisation and diathermy but rare after large loop excision (NNTH (delivery <32-34 weeks, birth weight <2000 g) >100 or NNTH (birth weight <1500 g) >500). Several new studies and reviews have recently been published on outcomes of pregnancy after treatment for cervical intraepithelial neoplasia.w12-w15 25 26 27 These new data increased the sample size and statistical power and enabled us, for the first time, to address the rarer and more serious outcomes such as perinatal mortality, severe and extreme preterm delivery (<28 weeks), and very low birth weight (<2000 g). These outcomes have a considerable impact not only on the mothers and babies concerned but also on the health budget for neonatal intensive care. The studies included in the earlier meta-analysis of Kyrgiou et al revealed an increased risk for preterm delivery and low birth weight associated with large loop excision,16 but in our meta-analysis we found that it did not significantly affect the more serious adverse obstetric events. Both meta-analyses corroborate the conclusion that ablation with laser has no effects on obstetric outcomes. The recent study by Jakobsson et al reported similar findings for cryotherapy.w14 Bruinsma et al reported that radical diathermy, an aggressive ablative method that destroys tissue to a depth of about 1 cm, was associated with perinatal mortality, extreme preterm delivery, and severe low birth weight, which was of the same order of magnitude as seen with treatment with cold knife conisation.w13 The significantly decreased risk of serious pregnancy outcomes in women treated by laser ablation in the study of Jakobsson et al,w14 is probably because of the preferential use of this procedure in Finland for women with small or less severe lesions and at low risk of preterm delivery (P Nieminen, personal communication, 2008). A study from Norwayw25 showed that women exposed to risk factors for cervical intraepithelial neoplasia are also at risk of serious pregnancy outcomes. Pregnant women who were subsequently diagnosed with cervical carcinoma in situ showed a risk of perinatal mortality, before cold knife conisation, that was already 21% higher than in women who had never been treated. Pregnancies after cold knife conisation were associated with a relative risk of 11.4. When we accounted for the increased risk before conisation, the adjusted relative risk for perinatal mortality was 9.4. Potential inflation of the relative risks due to the choice of a reference group, that does not share other risk factors for adverse pregnancy outcomes, was also mentioned by Sadler et al.29 In their study in New Zealand, treated women and women in the non-treated comparison group were both recruited from a colposcopy clinic. The resulting relative risk for preterm delivery associated with large loop excision was 1.30 (0.89 to 1.88), which was lower than the pooled relative risk.16 These data indicate that factors other than the treatment of cervical intraepithelial neoplasia are contributing to the risk of preterm delivery and studies that select their controls from the general population would therefore be biased in favour of detecting an effect. Moreover, women who require treatment for cervical intraepithelial neoplasia are selected for one treatment or another on the basis of several important characteristics that are likely to affect the chance of subsequent morphological damage to the cervix. These include size, severity, and site of the lesion, anatomical characteristics of the transformation zone, and suspicion of glandular neoplasia or microinvasive disease.39 In general, ablation is used to treat areas that are smaller and less severe, whereas excisional treatments are used for the former indication but also when there is a suspicion of invasion, a larger area, or transformation zones extending deep in the endocervical canal. This means that there is already an inherent bias towards removal of larger areas of the cervix with excisional treatments, which one would expect to be associated with a worse obstetric outcome in the future. Although all these factors could explain observed effects, the fact that the size and direction of the relative risks were consistent throughout the studies, with adjustment for various factors, supports the conclusion that cold knife conisation, laser conisation, and radical diathermy do increase the risk of serious adverse pregnancy outcomes. Moreover, study design characteristics and quality parameters (prospective v retrospective design, practice v population based selection of patients, adequacy of control for confounding factors, procedure for matching treated to non-treated patients) did not explain the heterogeneity between studies (data of meta-regression not shown but available from authors). Whether there is a critical threshold in the amount of tissue excised or destroyed that determines obstetric morbidity and success of treatment in terms of recurrent cervical intraepithelial neoplasia or cancer are key questions that remain to be answered. Having a clear understanding of this relation would be useful in guiding clinical decision making. Three recent studies have shown that treated women are still at higher risk than the general population for developing subsequent invasive cervical cancer, even many years after treatment,40 41 42 and some gynaecologists warn that less aggressive treatments might increase this risk.43 Evidence indicates that testing for human papillomavirus can help with the follow-up of women after treatment for cervical intraepithelial neoplasia. In particular, because of its high negative predictive value, it can clearly identify those women who are at low risk of residual or recurrent disease,44 45 46 and this could be used to alleviate reservations about shifting to less aggressive treatment practices. Moreover, optimal triage and diagnostic procedures should be developed that select only those progressing cases that need aggressive treatment.45 47 Introduction of prophylactic vaccines for human papillomavirus will result in a considerable decrease in the incidence of cervical cancer and precursor lesions requiring treatment, which will subsequently reduce the adverse obstetric consequences. All excisional procedures used to treat cervical intraepithelial neoplasia seem to be associated with adverse obstetric morbidity, but among these, only cold knife conisation is associated with a significantly increased rate of severe outcomes. The risk of serious obstetric morbidity associated with large loop excision of the transformation zone was not significantly different from unity, though we cannot exclude the possibility of any increased risk. Loop excisions that remove large amounts of cervical tissue probably have the same effect as knife cone biopsies. Most loop excisions in young women with fully visible transformation zones need to be only 1 cm deep, and this should protect against serious obstetric outcomes. Given the design of published observational studies, observed differences in perinatal mortality and severe premature delivery in treated versus non-treated women cannot be ascribed solely to treatment. Moreover, the precise conditions that determine the oncological and reproductive health outcomes are insufficiently known and require further research. Nevertheless, women of reproductive age should be informed about the potential impact on future pregnancies. Gynaecologists should tailor the management of young woman to minimise possible adverse obstetric outcomes at the same time as minimising residual disease rates. We thank F Bruinsma (Mother and Child Health Research, La Trobe University, Carlton, Victoria, Australia) and M Jakobsson (department of obstetrics and gynaecology, University Hospital, Helsinki, Finland) for the provision of additional procedure specific data; and Tini Van Dijk (Norwegian Cancer Registry) for translation help. Contributors: MA, MK, PM-H, and EP were responsible for conception and design. MA, MK, CS, and PM-H acquired data. MA, CS, and AOR analysed and interpreted data and drafted the manuscript, which was critically revised and edited by MK, PMH, GK, WP, and EP. MA and AOR carried out the statistical analysis. MA is guarantor. Funding: European Commission (Directorate of SANCO, Luxembourg, Grand-Duché du Luxembourg) through the ECCG (European cooperation on development and implementation of cancer screening and prevention guidelines); FP6 network of excellence “CCPRB” (cancer control using population based registries and biobanks) though the University of Lund, Sweden; DWTC/SSTC (Federal Services for Scientific, Cultural and Technical Affairs, Brussels, Belgium); Gynaecological Cancer Cochrane Review Collaboration, Bath; IWT (Institute for the Promotion of Innovation by Science and Technology in Flanders) through “SIMID,” a strategic basic research project (ref 060081); and FNRS (Fonds national de la Recherche scientifique), through TELEVIE, Brussels, Belgium (ref 7.4.628.07.F). IARC. Cervix cancer screening. IARC handbooks of cancer prevention. Vol 10. Lyon: IARC Press, 2005. Prendiville W, Cullimore J, Norman S. Large loop excision of the transformation zone (LLETZ). A new method of management for women with cervical intraepithelial neoplasia. Br J Obstet Gynaecol1989;96:1054-60. Jordan J, Martin-Hirsch P, Arbyn M, Schenck U, Baldauf JJ, Anttila A, et al. Management of abnormal cervical cytology. In: Arbyn M, Anttila A, Jordan J, Ronco G, Schenck U, Segnan N, et al, eds. European guidelines for quality assurance in cervical cancer screening. 2nd ed. Luxembourg: Office for Official Publications of the European Communities, 2008:191-232. Singer A, Monaghan JM. Lower genital tract precancer: colposcopy, pathology and treatment. 2nd ed. Oxford: Blackwell Science, 2000. Wright TC, Cox JT, Massad LS, Wilkinson EJ. 2001 consensus guidelines for the management of women with cervical cytological abnormalities. JAMA2002;287:2120-9. Martin-Hirsch P, Paraskevaidis E, Kitchener H. Surgery for cervical intraepithelial neoplasia. Cochrane Database Syst Rev2002;(2):CD001318. Prendiville W, Ritter J, Tatti S, Twiggs L. Colposcopy: management options. Philadelphia, PA: Saunders, 2003. Bostofte E, Berget A, Falck Larsen J, Hjortkjaer Pedersen P, Rank F. Conization by carbon dioxide laser or cold knife in the treatment of cervical intra-epithelial neoplasia. Acta Obstet Gynecol Scand1986;65:199-202. Kristensen GB, Jensen LK, Holund B. A randomized trial comparing two methods of cold knife conization with laser conization. Obstet Gynecol1990;76:1009-13. Kristensen J, Langhoff-Roos J, Kristensen FB. Increased risk of preterm birth in women with cervical conization. Obstet Gynecol1993;81:1005-8. Praest J. [Conization of cervix uteri. 5 years’ experience]. Ugeskr Laeger1979;141:3509-11. Haffenden DK, Bigrigg A, Codling BW, Read MD. Pregnancy following large loop excision of the transformation zone. Br J Obstet Gynaecol1993;100:1059-60. Paraskevaidis E, Koliopoulos G, Lolis E, Papanikou E, Malamou-Mitsi V, Agnantis NJ. Delivery outcomes following loop electrosurgical excision procedure for microinvasive (FIGO stage IA1) cervical cancer. Gynecol Oncol2002;86:10-3. Matsunaga J, Bergman A, Bhatia NN. Genital condylomata acuminata in pregnancy: effectiveness, safety and pregnancy outcome following cryotherapy. Br J Obstet Gynaecol1987;94:168-72. Herbert A, Smith JA. Cervical intraepithelial neoplasia grade III (CIN III) and invasive cervical carcinoma: the yawning gap revisited and the treatment of risk. Cytopathology1999;10:161-70. Kyrgiou M, Koliopoulos G, Martin-Hirsch P, Arbyn M, Prendiville W, Paraskevaidis E. Obstetric outcomes after conservative treatment for intra-epithelial or early invasive cervical lesions: a systematic review and meta-analysis of the literature. Lancet2006;367:489-98. Dersimonian R, Laird NM. Meta-analysis in clinical trials. Controlled Clin Trials1986;7:177-88. Sutton AJ, Abrams KR, Jones DR, Sheldon TA, Song F. Methods for meta-analysis in medical research. Chichester: John Wiley, 2000. Steichen TS. Submenu and dialogs for meta-analysis commands. Stata J2004;4:124-6. Warn DE, Thompson SG, Spiegelhalter DJ. Bayesian random effects meta-analysis of trials with binary outcomes: methods for the absolute risk difference and relative risk scales. Stat Med2002;21:1601-23. Laupacis A, Sackett DL, Roberts RS. An assessment of clinically useful measures of the consequences of treatment. N Engl J Med1988;318:1728-33. Crane JM. Pregnancy outcome after loop electrosurgical excision procedure: a systematic review. Obstet Gynecol2003;5:1058-62. Sasieni P, Castanon A. Call and recall cervical cancer screening programme: screening interval and age limits. Curr Diagn Pathol2006;12:114-26. Sadler L, Saftlas A. Cervical surgery and preterm birth. J Perinat Med2007;35:5-9. Raio L, Ghezzi F, Di Naro E, Gomez R, Luscher KP. Duration of pregnancy after carbon dioxide laser conization of the cervix: influence of cone height. Obstet Gynecol1997;90:978-82. Sadler L, Saftlas A, Wang W, Exeter M, Whittaker J, McCowan L. Treatment for cervical intraepithelial neoplasia and risk of preterm delivery. JAMA2004;291:2100-6. Nohr B, Tabor A, Frederiksen K, Kjaer SK. Loop electrosurgical excision of the cervix and the subsequent risk of preterm delivery. Acta Obstet Gynecol Scand2007;86:596-603. Mariategui J, Santos C, Taxa L, Jeronimo J, Castle PE. Comparison of depth of necrosis achieved by CO2- and N2O-cryotherapy. Int J Gynaecol Obstet2008;100:24-6. Paraskevaidis E, Kyrgiou M, Martin-Hirsch P. Have we dismissed ablative treatment too soon in colposcopy practice? BJOG2007;114:3-4. Paraskevaidis E, Bilirakis E, Koliopoulos G, Lolis ED, Kalantaridou S, Paschopoulos M, et al. Cervical regeneration after diathermy excision of cervical intraepithelial neoplasia as assessed by transvaginal sonography. Eur J Obstet Gynecol Reprod Biol2002;102:88-91. Gomez R, Ghezzi F, Romero R, Munoz H, Tolosa JE, Rojas I. Premature labor and intra-amniotic infection. Clinical aspects and role of the cytokines in diagnosis and pathophysiology. Clin Perinatol1995;22:281-342. Kunz R, Oxman AD. The unpredictability paradox: review of empirical comparisons of randomised and non-randomised clinical trials. BMJ1998;317:1185-90. Hillier SL, Nugent RP, Eschenbach DA, Krohn MA, Gibbs RS, Martin DH, et al. Association between bacterial vaginosis and preterm delivery of a low-birth-weight infant. The Vaginal Infections and Prematurity Study Group. N Engl J Med1995;333:1737-42. Viikki M, Pukkala E, Nieminen P, Hakama M. Gynaecological infections as risk determinants of subsequent cervical neoplasia. Acta Oncol2000;39:71-5. Kekki M, Kurki T, Pelkonen J, Kurkinen-Raty M, Cacciatore B, Paavonen J. Vaginal clindamycin in preventing preterm birth and peripartal infections in asymptomatic women with bacterial vaginosis: a randomized, controlled trial. Obstet Gynecol2001;97:643-8. Prendiville W, De Camargo M, Walker P. The use and abuse of LLETZ. CME J Gynecol Oncol2000;5:85-7. Kalliala I, Anttila A, Pukkala E, Nieminen P. Risk of cervical and other cancers after treatment of cervical intraepithelial neoplasia: retrospective cohort study. BMJ2005;331:1183-5. Soutter WP, Sasieni P, Panoskaltsis T. Long-term risk of invasive cervical cancer after treatment of squamous cervical intraepithelial neoplasia. Int J Cancer2005;118:2048-55. Strander B, Andersson-Ellstrom A, Milsom I, Sparen P. Long term risk of invasive cancer after treatment for cervical intraepithelial neoplasia grade 3: population based cohort study. BMJ2007;335:1077. Lamont RF, Sarhanis P. Precancerous changes in the cervix and risk of subsequent preterm birth. BJOG2007;114:775-6. Paraskevaidis E, Arbyn M, Diakomanolis E, Martin-Hirsch P, Koliopoulos G, Makrydimas G, et al. The role of HPV DNA testing in the follow-up period after treatment for CIN: a systematic review of the literature. Cancer Treat Rev2004;30:205-11. Arbyn M, Paraskevaidis E, Martin-Hirsch P, Prendiville W, Dillner J. Clinical utility of HPV DNA detection: triage of minor cervical lesions, follow-up of women treated for high-grade CIN. An update of pooled evidence. Gynecol Oncol2005;99(suppl 3):7-11. Arbyn M, Sasieni P, Meijer CJ, Clavel C, Koliopoulos G, Dillner J. Chapter 9: Clinical applications of HPV testing: a summary of meta-analyses. Vaccine2006;24(suppl 3):78-89. Arbyn M, Buntinx F, Van Ranst M, Paraskevaidis E, Martin-Hirsch P, Dillner J. Virologic versus cytologic triage of women with equivocal Pap smears: a meta-analysis of the accuracy to detect high-grade intraepithelial neoplasia. J Natl Cancer Inst2004;96:280-93.